Since we moved into our new house last June I've been slowly clearing out things from here and there as we decorate rooms and sort through boxes, but I hadn't had a proper wardrobe clear out, mainly because it felt like the biggest thing to tackle so I kept putting it off -until last week! I like to have a proper clear out every couple of years, it keeps things tidy and helps make sure I'm not filling our wardrobe with with nonsense that will never be worn, it also makes sure there's a little extra room for new thing's -always good! I actually really enjoy doing it so much so that I also love to help friends and family too so here are my top tips for making sure you do it successfully. First of all you have to take everything out of the wardrobe, drawers and where ever else you have clothes and pile them all on the floor. 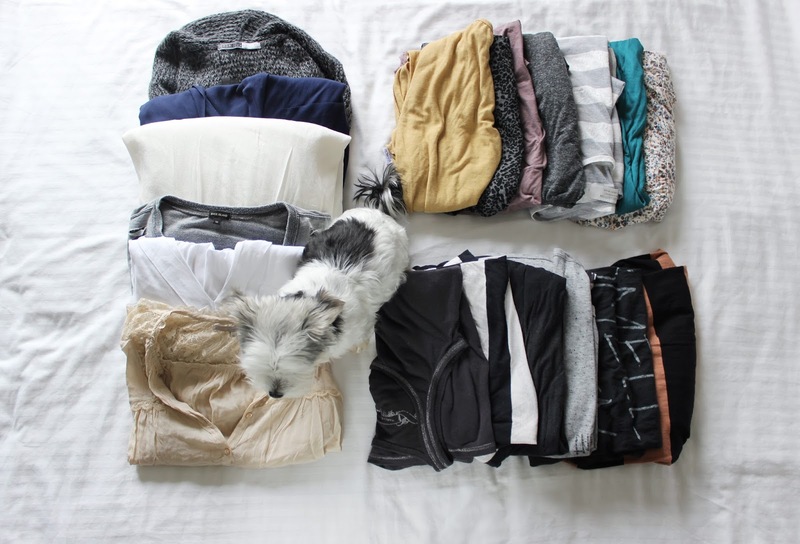 I find this does two things, it forces you to actually go through every piece and it means you have to actually do it, or the huge messy pile of clothes on your floor will stay there forever! Now you have to begin sorting it all into four main piles -keep, throw, charity/sell and repair, and you have to be HARSH when you do this! And I mean harsh! Especially if you haven't done it in quite some time (or ever!). Things you know you want to keep go straight into that pile, and things that you know you're keeping but need fixing up (missing buttons, a small burst seam, small things) go into repair. Things that are past it, completely ruined or worn to death go straight into the throw pile -these should never go to charity, and then what you're letting go of goes in the charity/sell pile. If you struggle to be harsh enough on your own, it's sometimes better to have a friend help you. "if I found this in a shop today, would I buy it?" "if I was seen out in this, would I be happy about it?" "has it seen better days?" "does this suit me or my style now?" That last one is really important! Styles change as we get older, if you bought something at 18 that you loved, and you're now 28, how likely is it that your tastes are still the same -not very. I like to ignore that rule that if you haven't worn something in a year, you should let it go - I don't agree. I think you should base your decision more on you and your style, if it suites you, and works well with your style then yes, keep it! I have plain white and navy grandad shirts from Topshop that I absolutely love! They suit me, my favourite slouchy tailored style and they flatter my figure -I'd be silly to let them go. 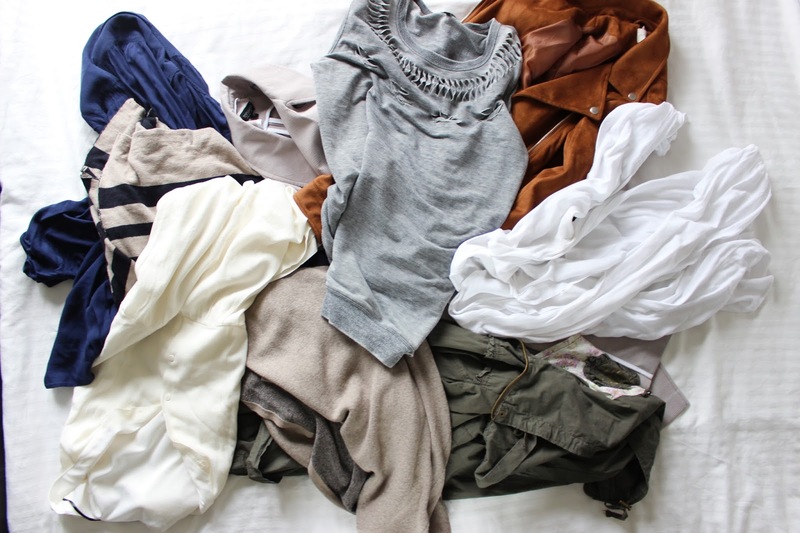 Even if I haven't worn them in the past year they're basics that suit my wardrobe and I wouldn't be without them. What makes a must have item for me won't be the same for everyone else and that's something you have to think about as your going through this process. For example, my best friend and I have pretty much the opposite basic style, so those grandad shirts I love along with some very tailored blazers wouldn't be a good fit for her wardrobe. Where as the sweeter more baby doll style clothes she prefers would do nothing for me. Now the most difficult part -the sentimental or hopeful items your holding on to. I've been guilty of it so many times, I'm sure everyone has at some point. First sentimental! Really if your just holding onto it because it reminds you of a first date or your first holiday without your parents -it should really go, but...because I'm a sucker for romance and all things like that I'd say its fine to keep one or two things just because they make you happy...but only one or two (maybe three) any more and well, you're just defeating the point of doing this in the first place. I have a green patterned bandeau top from Topshop that I bought for the first holiday Paul and I ever took together. I worn it non-stop with denim shorts and then for the rest of the summer when we got home. The elastic has totally gone and it couldn't ever be worn again but it just makes me so happy when I see it. Now the others, the "hopeful" clothes, the "I'll wear this when I'm thinner clothes" -they need to go! I know we like to think of them as incentive pieces (I've been there so many times) but they aren't, all they're doing is making you sad and taking up space in your wardrobe. A better way to look at it is that if you are trying to lose weight instead of holding on to a pair or jeans that you may never fit in to, why not treat yourself when you get the the size you want to be. That way those things can find a place with the rest of your things and you can enjoy them. 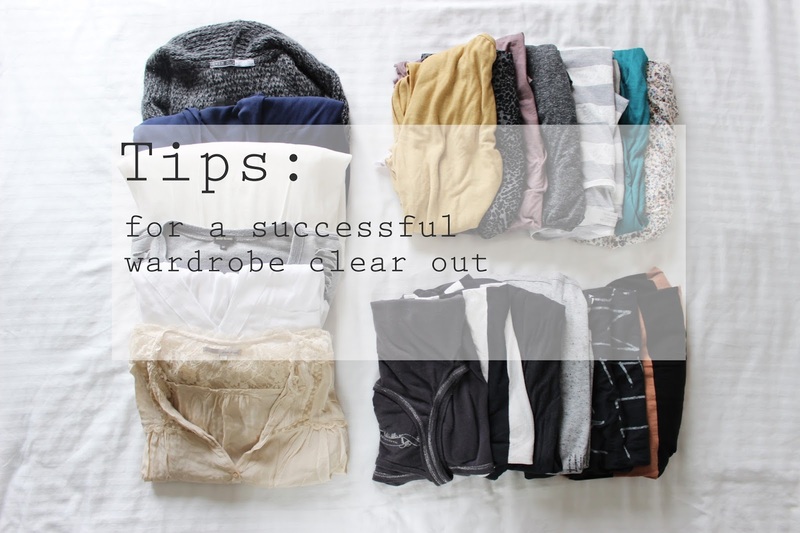 Once you've cleared out all that had to go from your wardrobe you can start to build a capsule or seasonal wardrobe and fill in any parts your missing. I think once our bedroom has been decorated and I have my clothes rail back up I'll show you mine. Do you enjoy having a good clear out? My daughter is helpful in my clean outs at least once a year. And she helps me coordinate what's left with a fresh eye.